Two Scobell comics in one dang week! What am I? Whitington? I hope I can keep up this productivity and I hope you like this comic! Oh snap, two Scobells back to back, the old streak has ENDED and a new streak officially begins! 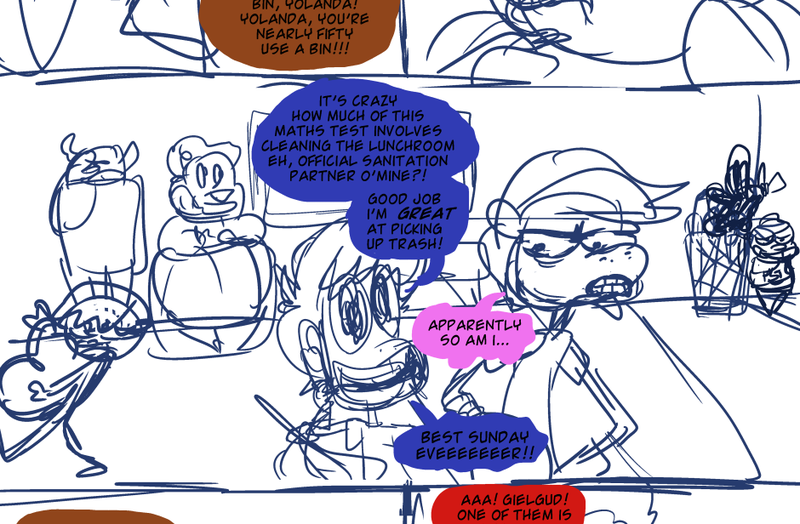 It's actually been THREE Scobell comics in row!! And thank you!! Do we need to start sending out the "Have you seen me" milk cartons with Whitington's face on them? Sorry you put the work in - you guys have pretty layered jokes though, I'm sure you can salvage some of what you were working on? The principal sounds like a *gasp* .. TOTALITARIAN! We know she at least likes tables. But her view on chairs? That is yet to be seen! MMM YES MORE OF MY NAT VOICE MMMMMMM. Every single time it shows up in the comic I just feel so fulfilled, you have no idea! It's really special and very great! I think Amy's hair is a PERFECT color in this one and I loooove the expressions!! Especially panel 3 Nat because wow look at that seamless transition from face into neck! That is EXACTLY the kind of thing I like. Your Nat voice is the best! IT'S special and great!! I'm glad that you're glad to see it embraced!! I really can't imagine her any other way, now! Yay, I think darker is the way to go too! Thank you, I had fun drawing them faces and you've definitely put chinless heads in my thoughts lately!